Today CouchTycoon launches "Asset Slips To Go". Based on Ebay To Go you can purchase real Asset Slip Prints that can be converted into digital, marketable Asset Slips on CouchTycoon.net during Initial Couch Offering (ICO) period. Asset Slip Prints basically represent NO RIGHTS of ownership. They are solely intended to be used as souvenier. But together with the purchase of Asset Slip Prints the purchaser gets a voucher with a unique code that allows the buyer to convert the quantity of bought Asset Slip Prints into digital Asset Slips. Purchasing Asset Slips this way brings a lot of advantages. Buy Asset Slips as a present for someone else! Buy Asset Slips with your Creditcard! Get a real certificate of your investment! Due to this feature is just a test so far, only Asset Slips of the PotBag project can be bought via Ebay To Go. Thank you for voting for the CouchTycoon Social Investment Network on Killerstartups! Thanks, CouchTycoon Investors for pushing us into the Killerstartups.com monthly top 10! Please keep voting for us to let CouchTycoon reach the alltime top 10 too. I hope you like our tiny thing we are improving permanently to make micro investments of start-ups and projects much more comfortable for you. Please vote for us on KillerStartups! CouchTycoon.net is listed on KillerStartups now. Please help Mr. Idle and his small German start-up to reach the top 10 of KillerStartups! Many thanks in advance! Mr. Idle thanks all participants of CouchTycoon competitions on LogoSauce.com! Special thanks are going to David, as one of the first CouchTycoon supporter and to the winning participants "onesummer" (who won the actin fields competition) and "black_wolf" (who won the vole hole comp.)!! here are the winning submissions. CouchTycoon Friends n Family - Help Mr. Idle! Please help Mr. Idle to find the best decision. Which of the following drafts do you like most? ok, not really open - sorry! But open for ourselves. Indeed we simulated the first transactions on our tradingplatform. And: it works!! Really! Please be patient till we will open it for some more of you to take part in (probably) the most exciting way to play "Monopoly". Mr. Idle thanks Domco for the intermediary results! As the CouchTycoon chief-developer Domco announced tonight, the trading platform in the background of the CouchTycoon system is now completed!! The CouchTeam - on behalf of Mr. Idle - is really happy about this big step for the whole team. So we can start the internal tests tommorow. That´s it! It´s a fixed exchangerate to the US Dollar and all valuta transactions will be done in US Dollar on CouchTycoon. Mr. Idle accepts applications for "private chicken test" - as he calls the private beta phase - testers now. Any interested chicken tester apply now! Just register here. But you don´t need to comment on the couchtycoon.net yet. Nothing regarding the interface is like it will be ;) Mr. Idle let´s you know when you can start testing. Finally the LogoSauce competitions can start! Let´s start the next competitions. The very next will be the one for "action fields" on the CouchTycoon game board. Couchtycoon is a Friends n Family Ventures Network for trading, starting up and managing ventures. Doing real business as easy as playing Monopoly. The "friends and family" put ideas into action. Please find details about CouchTycoon bellow or take a look @ Blog.CouchTycoon.net. 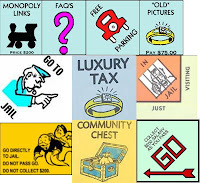 The website follows the concept of a monopoly board. While doing business @ CouchTycoon users move on the virtual gameboard. Please design action-field-symbols for the CouchTycoon gamboard. Please check blog.CouchTycoon.net for a scribble of the gameboard. The competition is open from 2nd of August until the 15th of August. CouchTycoon is a pioneering internet project. Couchtycoon is Friends n Family Venture Network. It enables entrepreneurs to raise money for innovative projects on the one hand and enables Investors to participate in the success and growth of promising on- and offline-projects from zero hour on. As a result all the participating web people represent a "Friends n Family Network"
Please Check blog.CouchTycoon.net for information about the project. The prize money is payed in CouchChips which is the Currency of CouchTycoon it is investable in every traded project at CouchTycoon. Of course the bought shares can be sold without a holding period and changed in USD again. The CouchChips are transferred to your CouchAccount immediately after the launch of CouchTycoon in September. Of course we hope that you stay seeded @ the couch! The competition winner will aswell be featured @ CouchTycoon. As the head of my family and of my venture tool CouchTycoon I´m a frequent traveller too. The site I just found called DOPPLR is perfect for me, my family and business partners. DOPPLR in their own words: "How does Dopplr work? It lets you share your future travel plans with a group of trusted fellow travellers whom you have chosen. It also reminds you of friends and colleagues who live in the cities you're planning to visit. You can use the service with your personal computer and mobile phone." I really like Sandy because she seems to become a really helpful assistant. So IwantSandy to become one of my personal assistants. I have to see how she will improve durinig her qualifying period but I´m confident! Mr. Idle Found a Great New Tool - Betabug! Screening Killerstartups.com, Mr. Idle found a very helpful tool for his CouchTycoon website. Well Mr. Idle doesn´t call its website versions "private beta" or "public beta", he calls them "private chicken test" and "public chicken test". However it is the same in meaning. So Mr. Idle decided to use his new discovery betabug.com on his website. If you find any bug after Mr. Ilde launches his chicken test sites, please comment on the bugs you will certainly find! Today Mr. Idle decided to aspire to beat one of his arch rivals. Mr. 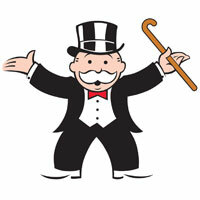 Monopoly - also known as Rich Uncle Pennybags. This approximately 71 aged has disused. At the moment listed as #6 in "Forbes Fictional 15", Mr. Idle doesn´t want to see him there any longer. See the complete list of Mr. Idle´s rivals at Forbes! Mr. Idle was wondering about the relaunch of Killerstartups.com. Ads and a new layout are the first changes Mr. Idle took notice from. He doesn´t really like these improvements. He liked the former version much more. It was a straighter and much more informative. The content was focused on the startups - not on the layout around. First of all let me tell you how the desaster began. In January this year - Mr. Idle wasn´t born this time - we had the basic ideas for the project CouchTycoon. To ensure, that no one else would grab this great name and the couchtycoon.com domain as well, we decided to register it immediately. The new offer of microsoft´s "office live" seemed to be good for that. Free .com domain, small website package for some information and e-mail accounts. Web mail accounts - but ok. We didn´t know this time that transferring this domain to another host would become that complicate. Meanwhile Mr. Idle was born. The fantastic character Matt from Graphite Design created. And while Mr. Idle took over the driver seat at the CouchFamily (since Mr. Idle was born we call our team members and partners "family") events were unfolding and as a result we forgot to keep one eye on Bill. Mr. Idle simply forgot to cancel the deal with Bill (the "office live" package) in time. Ok, Bill won the first battle against Mr. Idle by locking the .com domain for 60 days. So what. Mr. Idle has to wait now till Bill will unlock the .com again and will keep you informed here on this blog. Also the detailed information about Mr. Idle´s new LogoSauce competitions will be published and provided here. onovo, Modelabel in Beverly Hills: 5 mil. QueerCity, similar to qype: ? 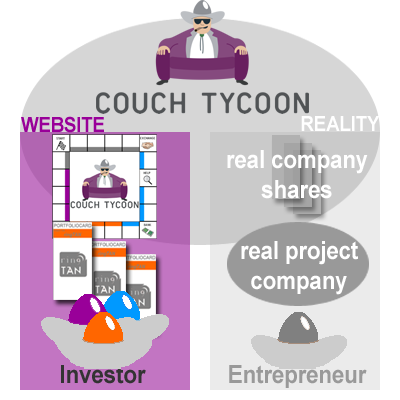 About the "CouchTycoon Friends n Family Venture Network"
mr. idle (the phat guy on the couch) is tired of being idle and reading about any big deal rupert murdoch did, about any startup google recently grabbed or “the next big thing” any blog favors. Although he is not willing to leave his comfortable couch from where he already controls his old economy business. So in January this year he decided to start the "CouchTycoon Friends n Family Venture Network" to free people´s idle money from under the mattress instead of being idle him self. From today on his ultimate ambition is to liberate as much money from being idle as possible. With CouchTycoon mr. idle enables any one else of his friends and family network to participate in deals or startups. Both investors and entrepreneurs. The whole CouchTycoon friends n family network is going to be enabled to invest in “the next big thing” or in the acquisition of the empire state building by mr. idle. Starting at an amount of approx. 5 usd. On the other side mr. idle enables any network member to start a new business or a big deal as an entrepreneur as an alternative to talk to 15 venture capitalists, asking his grandmother or funding at prosper. mr. idle loves both playing the “monopoly2.0″ on one side and acting as serious investor on the other side. Since we received our logo we think about how the man sitting on the couch could be called. A few days ago we received an invitation for a birthdayparty from someone we know - we didn´t hear anything from that person for several years! But that was the moment we found the perfect name! We decided to call him "Mr. Idle"
It is a tribute to the artist-tecno legend formerly known as Mr. Iedl now staying where the black dog is barking. By the way HAPPY BIRTHDAY!! This is your digital gift. The time will show if it is a small gift or if it will become a huge one. Now Rupert´s new archenemy is born. From now Mr. Idle will represent the CouchFamily as a kind of a president. Every deal the CouchFamily does, every step CouchTycoon will go - it will be done by Mr. Idle. Maybe the next Forbes´ #1. Our Venture is still in development and we did´t any marketing yet. But some of you are already asking what exactly we are doing. So here are some words about our spirit and what we are going to build. Mr. idle (the dynamic guy on the couch) doesn´t not want to sit on his couch any longer to read about any big deal his big rival rupert murdoch did, about any startup google recently grabbed or “the next big thing” any blog favors. He can do the same kind of deals as a community member of CouchTycoon. CouchTycoon enables anyone to participate in such deals or startups. Both investors and entrepreneurs. The community is going to enable Mr. idle as an investor for example to invest in “the next big thing” or in the acquisition of the empire state building starting at an amount of approx. 5 usd. On the other side CouchTycoon enables you as entrepreneurs starting a new business or a big deal within the Community as an alternative to talk to 20 venture capitalists, asking your grandmother or funding at prosper. As part of the couch community Mr. idle is smarter than rupert, he can mobilize more money and he has got a larger network. However you can become a CouchTycoon as a serious investor or to have fun playing the "monopoly2.0"
after the winner of our logosauce.com competition "graphitedesign" sent us our new logo, we couldn´t wait any longer. finally we have a logo. yesterday "graphitedesign" the winner of our logosauce.com competition sent us our logo.